One of the advantages of germinating your own tomato (Solanum lycopersicum) seeds is that you can get choice varieties not usually available as started transplants in your local garden center. Hundreds of tomato varieties of many different shapes, colors, growing characteristics and fruit tastes exist, and it's rewarding to find tomatoes that suit your growing conditions and taste preferences. By starting tomato seeds indoors, you get a jump start on the growing season, especially important in areas with short summers where some tomatoes might not have time to mature. Have your seeds on hand and ready to sow six to eight weeks before the last frost date for your area. Also prepare the growing containers and growing medium. Use clean, 3-inch pots with drainage holes that have been washed in soapy water, rinsed and then soaked for five minutes in a mixture of 1 part household bleach to 9 parts water. Rinse the pots in clear water and let them dry. Use a quality soilless potting mix or make your own by combining equal parts of peat and perlite. Fill the pots with growing medium to within 1 inch of the rim. Sow seeds 1/4 inch deep and spaced 1 inch apart, or about two or three seeds per pot. Firm the potting mix over the seeds and label the pots with the variety names. Water the seeds by placing the pots in a container of water. The water will wick into the soil mix through the drainage holes without disturbing the seeds. Remove the pots from the water and put them in a sunny area such as a south-facing window. You can also use artificial light if you don't have natural light. Plants need to be within 3 or 4 inches of the artificial light source. Soil temperature has an effect on how quickly seeds germinate. 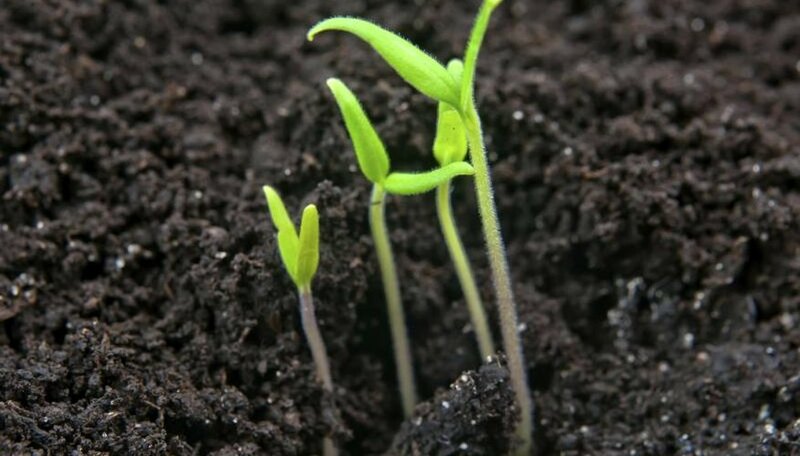 If the soil is at 75 degrees Fahrenheit, seeds usually germinate in about seven days. Cooler temperatures slow germination, with seeds in 60 degrees F soil taking two weeks to sprout. If the soil temperature goes down to 50 degrees F, seeds take about 43 days to germinate. Use a propagating mat to increase soil temperature if needed. Check the potting mix daily, keeping it moist but not soggy. Tomato seed leaves, or cotyledons, are narrow and elongate. The plant's true leaves emerge from between the two seed leaves. If you're using a sunny window, once the seeds sprout, turn them a quarter turn each week so they grow evenly. When seedlings have one or two sets of true leaves, choose the strongest seedling in each pot and thin out the smaller ones. Snip each unwanted seedling off at the soil line with a pair of scissors. As the tomato seedlings grow, give them more sun each day. When they have several sets of true leaves, gradually get the seedlings used to their permanent location, whether it's in the garden or as a container plant on the patio. Freezing weather should be over and the soil temperature 60 degrees F or above. Use a soil thermometer to check the temperature. Over the course of about a week, leave tomato seedlings in their intended spot for a few more hours each day. Don't let the plants dry out. When all danger of frost is over, plant the hardened-off seedlings in the garden in full sun. Tomatoes are frost-tender perennial plants grown as annuals. If a late frost threatens, cover the plants with a frost blanket held off the foliage of the plant or use a water-filled frost protection product that encircles the plant. Provide fertile, well-draining soil. Dig a hole somewhat bigger than the pot size and deep enough so you can sink the plant deeper than its current soil level. Remove the lowest two or three leaves and bury the stem in the soil so that just the top two or three sets of leaves are above ground. The stem roots along its length. Add a stake or tomato cage if the tomato is an indeterminate variety which continues to grow all season long. Water the plant well, soaking the root area.